These 21 Day Fix Vegetarian Meal Plan recipes are perfect for your healthy lifestyle! The delicious vegetarian recipes I’ve gathered in this post will help you avoid meat and still eat a wide variety of meat-free recipes. The 21 Day Fix can be difficult to plan for even without any other dietary restrictions, which is why I’ve assembled a full 12 days of meals that take into consideration that some of you may want to avoid meat. I’ve tried to work protein into your snacks and breakfasts to help make sure you have plenty of great options to keep you going. You can make all of these recipes or just pick a few. There will be LOTS of food so make sure you plan on eating leftovers or freezing some for later use–this is why there are meal ideas for 12 days instead of 14. These recipes are great for a 21 Day Fix vegetarian meal plan because they have all the container counts already calculated for you AND they have no meat. It takes all of the guess work out of it for those of us who are looking for 21 Day Fix options as well as vegetarian options. Breakfast: Apple Cinnamon Baked Oatmeal | My Crazy Good Life Baked oatmeal recipes are great for meal prepping because you can bake once and be good for the whole week. Lunch: Open Faced Avocado & Tomato Egg Sandwich | Dana Nicole Fitness This recipe is packed with flavors, textures, and protein. It’s the perfect addition to our 21 Day Fix Vegetarian Meal Plan! Dinner: Vegetable Chowder | My Crazy Good Life Leave out the Greek Yogurt if you prefer non-creamy soup (I do!). You’re going to love this hearty vegetable soup. Snack: Apple Cookies | My Crazy Good Life Apple cookies will curb the sweet tooth and with nut butter they can also give you a little extra protein boost! 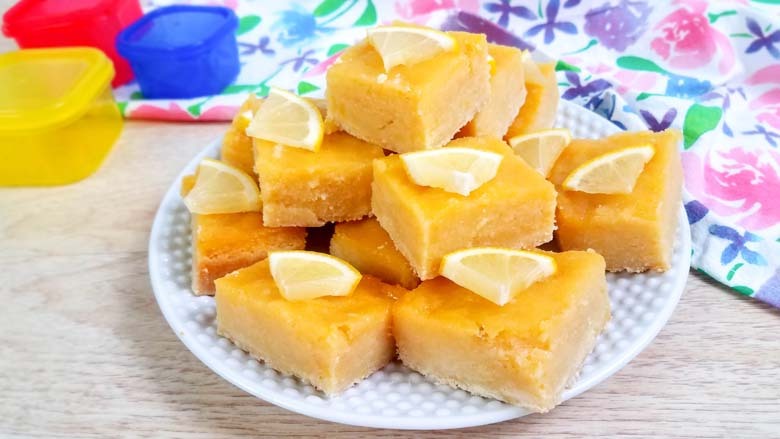 Dessert: Lemon Bars | My Crazy Good Life These lemon bars are light and refreshing, and so easy to prepare. Snack: Coconut Overnight Oats | Carrie Elle Coconut overnight oats are easy to prep and you can make some for breakfasts as well! 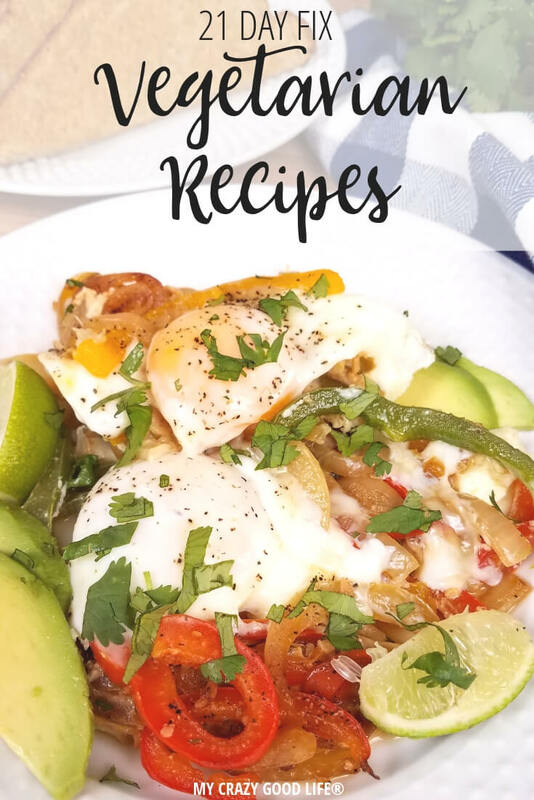 Breakfast: Fajita Breakfast Casserole | My Crazy Good Life I love this healthy way to start your day! The fajita veggies are delicious for breakfast. Lunch: Quinoa Tacos | My Crazy Good Life Whether you make this vegetarian taco filling into proper tacos or use it to top a salad or baked potato, this is a delicious lunch idea! Dinner: Spinach and Strawberry Caprese Salad | Confessions of a Fit Foodie I love adding hard boiled eggs, quinoa, and/or tofu to this salad for some protein instead of the chicken. Desserts: Peanut Butter Fudge | Confessions of a Fit Foodie Seriously one of our family favorites, this recipe will trick you into thinking you’re cheating! I love to hold the peanut butter aside and freeze the bottom layer of chocolate, then add peanut butter and the chocolate on top to make peanut butter cups. Snack: Chocolate Peanut Butter Banana Ice Cream | Carrie Elle Another delicious ice cream recipe that takes almost no work to prepare and works great in this 21 Day Fix vegetarian meal plan. Breakfast: Fig Breakfast Bowl | My Crazy Good Life These fig breakfast bowls are delicious and they’re easy to put together. Lunch: 21 Day Fix Double Chocolate Peanut Butter Shake | Carrie Elle You can have chocolate peanut butter on the 21 Day Fix..not kidding! Dinner: Roasted Broccoli | Carrie Elle Summer is the perfect time to learn how to roast veggies. They make a great addition to any meal, especially dinner. Once you find your favorites you might end up like me, making a meal out of all kinds of roasted veggies. 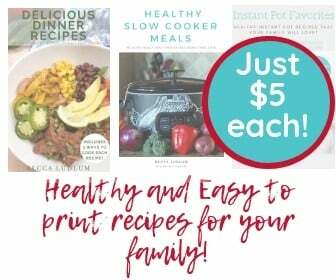 Perfect for a 21 Day Fix vegetarian meal plan! Snack: Breakfast Banana Split | Confessions of a Fit Foodie When the craving strikes for something sweet and delicious you can work in this breakfast banana split recipe, makes a great snack! Dessert: Chocolate Mocha Mousse | Beachbody Blog It’s probably time for something chocolately and delicious am I right? Breakfast: Easy Egg Muffins | My Crazy Good Life You can make a whole batch ahead of time and put them in the fridge to be warmed up all week. Lunch: Cauliflower Rice | Confessions of a Fit Foodie If you haven’t tried this new method of cooking with cauliflower yet, I highly recommend it! Dinner: Instant Pot Mac and Cheese | Confessions of a Fit Foodie Easy to make mac and cheese that is fix friendly and super fast! Dessert: Snickers Greek Yogurt | The Healthy Empowered Mama Greek Yogurt has more protein than regular yogurt and with a Snickers twist you won’t even mind working this one into your meal plan! 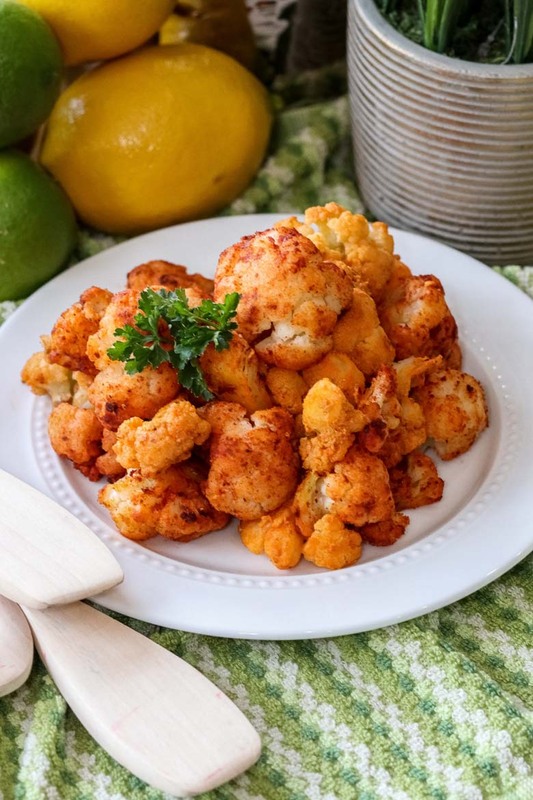 Snack: Buffalo Cauliflower Bites | My Crazy Good Life This recipe is addicting–even friends who don’t care for cauliflower have LOVED it! Breakfast: 2 Ingredient Banana Pancakes | My Crazy Good Life Just 2 ingredients! What could be easier? Lunch: Spinach and Artichoke Dip | The Foodie and The Fix You can serve this with toasted pita or veggies or even spread it on cloud bread! Dinner: Crustless Zucchini Quiche | Confessions of a Fit Foodie Breakfast for dinner? This quiche is so much more than just one meal time! Snack: Cheesy Cauliflower Bread | Fit Mom Angela D You can work this recipe in as a snack or add your favorite red sauce and work it in at lunch or for dinner! Dessert: Strawberry “Cheesecake” | Lisa Hov Fitness This strawberry cheesecake is a tasty alternative to the real thing. It’s creamy and delicious and will totally knock out any cravings you might be having by Friday night. Snack: Homemade Salsa Verde | The Foodie and The Fix Serve with some crisp veggies for dipping or toast some whole grain tortillas! Lunch: 4 Ingredient Feel Better Soup | The Foodie and The Fix Feel better soup is great even when you don’t necessarily need to feel better. Dinner: Butternut Squash Soup | My Crazy Good Life This soup is creamy, delicious, and so easy to make. Snack: 21 Day Fix Dole Whip | My Crazy Good Life A fresh, delicious, and light Summer treat that everyone will love! Dessert: Chocolate Shakeology Mug Cake | Simple Clean Fitness When you just really need some cake…this recipe will help! Snack: One Step Easy Homemade Salsa | My Crazy Good Life Serve with some crisp veggies for dipping or you can toast up some whole wheat tortillas or cloud bread! Breakfast: Instant Pot Mini Fritattas | My Crazy Good Life You can make these once and warm them up all week long for breakfast. Add in your favorite fresh veggies to create a unique and delicious flavor. Lunch: Kale Blueberry Salad| Carrie Elle This is the perfect spring / summer salad. So fresh and delicious! Dinner: 3 Ingredient Low Carb Cauliflower Pizza | My Crazy Good Life This simple cauliflower pizza crust makes a delicious alternative to regular crusts and it’s 21 Day Fix friendly. Snack: Healthy Ranch Pretzels | My Crazy Good Life I love this delicious grab and go recipe! Dessert: Raspberry Filled Chocolates | The Foodie and the Fix Chocolates that are easy to make, filled with delicious raspberry filling, and totally 21 Day Fix friendly! Snack: Cloud Bread | My Crazy Good Life I bet you didn’t think a “bread” would be on the snacks list! Breakfast: French Toast | My Crazy Good Life This French toast recipe for one is PERFECT for a delicious, hot, breakfast to get you moving on Monday morning! Lunch: Open Faced Avocado & Tomato Egg Sandwich | Dana Nicole Fitness I love making open faced sandwiches. It’s an easy way to cut out unnecessary calories and carbs while still having a filling and delicious mid-day meal! Dinner: Three Cheese Zucchini Bake | Confessions of a Fit Foodie This three cheese zucchini bake is delicious and simple to make. It’s a 21 Day Fix friendly recipe that the whole family will love. Snack: Easy Homemade One Step Salsa | My Crazy Good Life You can dip veggies, chips, or even cloud bread in this easy homemade salsa. 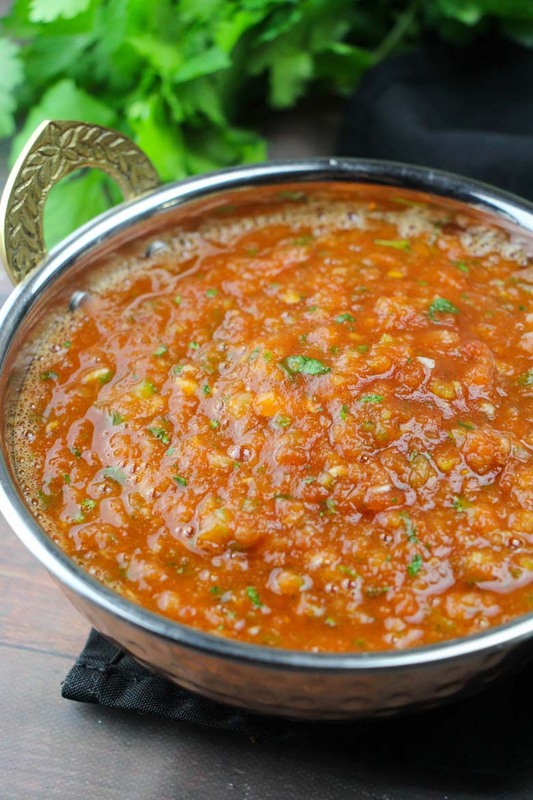 Just one step and you’ll have delicious salsa for the whole week! Dessert: Cherry Chocolate Chunk Ice Cream | Beachbody Blog This cherry chocolate chunk ice cream is a MUST try. It’s tasty, you won’t want to share. Breakfast: Garden Vegetable Frittata | Confessions of a Fit Foodie I love incorporating eggs into my 21 Day Fix vegetarian meal plan because they’re protein packed and lean! Lunch: Sweet Potato Black Bean Quesadillas | Dis Food Diary (2 Yellow, 1 Blue) These sweet potatoes black bean quesadillas packs nice protein punch to get you over that lunch time slump! 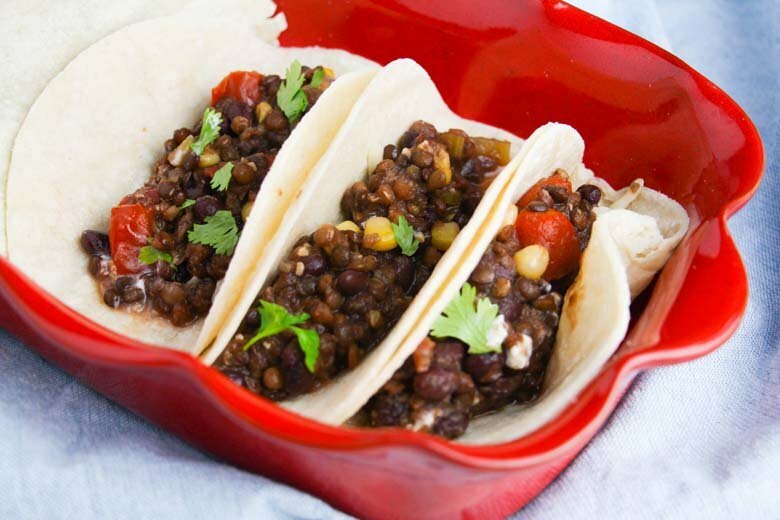 Dinner: Lentil Tacos | My Crazy Good Life Taco Tuesday is back! We love this flavorful dish. Snack: 21 Day Fix Watermelon Salad | Carrie Elle You can’t go wrong with this refreshing and sweet watermelon salad. Dessert: Chunky Monkey Shakeolgy | Kerry Lynn Fitness (1 Red, 1 Purple, 2 tsp) If you need a sweet dessert and also like to work in some Shakeology this is a great recipe to try! Breakfast: Two Ingredient Pancake Recipe | My Crazy Good Life These pancakes are very simple to make…just 2 ingredients and a few minutes on the stove and they’re ready to go! Lunch: Eggplant Roll Ups | Inspired Housewife These eggplant roll ups are easy to make, tasty, and they’re great for dinner one night and lunch the following day…two meals in one is always a win in my book. Dinner: Butternut Squash Soup | My Crazy Good Life You can make this one vegan buy omitting the cream & bacon topping, trust me it’ll be plenty smooth and delicious without it! Snack: Veggies and this delicious Ranch Dip | The Foodie and The Fix This will be a great combo for those busy days. You can preparation the ranch dip and veggies in bags and you’ll be all set for the week. Dessert: Dairy Free Chocolate Ice Cream | My Crazy Good Life This tasty treat will blow you away. It’s so simple to make but it packs big flavor and is completely 21 Day Fix friendly. Breakfast: Easy Crepe Recipe My Crazy Good Life This is such an easy recipe, and it’ll impress everyone in your house. Top with berries if you like, and enjoy! Lunch: Egg Salad | My Crazy Good Life Egg salad is great for meal prepping. You can make a few containers to grab for lunch during the week and then you don’t have to stress about what to eat on those busy days. Dinner: Instant Pot Mac and Cheese | My Crazy Good Life A healthy alternative to the boxed stuff and the Instant Pot means it will be just as quick and easy without all those processed ingredients! Snack: Queso Dip and Homemade Chips | Confessions of a Fit Foodie You won’t believe that this homemade queso dip is 21 Day Fix friendly. It’s simple but full of flavor. Great for a healthy option at parties and gatherings too! Dessert: Pumpkin Oat Cookies | The Foodie and the Fix These pumpkin oat cookies go great for a quick on the go breakfast in a bind as well. Breakfast: Coconut Overnight Oats | Carrie Elle Coconut overnight oats are a dream for meal prep. You can make one batch and eat them all week long for breakfast or snacks! Lunch: Simple Spinach Pesto | Confessions of a Fit Foodie This simple spinach pesto is great with cloud bread or with salads. You will love this super easy recipe that is packed with amazing flavors! Dinner: Gazpacho Soup with Turnip Fries | My Crazy Good Life I love this as a summer night meal! Chilled Gazpacho Soup with hearty turnip fries–delish! Snack: Cloud Bread | My Crazy Good Life Cloud bread is great with dips, hummus, sandwiches, and more. You can whip up a batch for the whole week. It’s light, fluffy, and deliciously simple! Dessert: Coffee Ice Cream | My Crazy Good Life A no churn ice cream recipe that is perfect for one…or to share if you think you can! What weight bracket would this meal plan be for? Looks amazing! Thanks! Thank you so very much for all the hard work you do and share!!! You are amazing and I truly appreciate everything! I have been a vegetarian all my life – however not necessarily a “healthy” one. I eat way too much cheese, pasta, etc. I have a hard time losing weight because all “diets” only allow tofu, etc for protein. The limited choices get so boring. I am anxious to try the recipes you have suggested! Thank you again! Have you by any chance expanded this or would you be willing to? I love what you have here and I need the help with the planning right now. Could you tell me what calorie bracket this meal plan is for? This meal plan is intended to be used with all calorie brackets–you choose which recipes to use and how many servings to eat. I’ve found that my readers use these plans more than the ones that are created for specific calorie brackets. I have several of the calorie bracket plans too, if you’d like I can pull a link for you–which calorie bracket are you in?